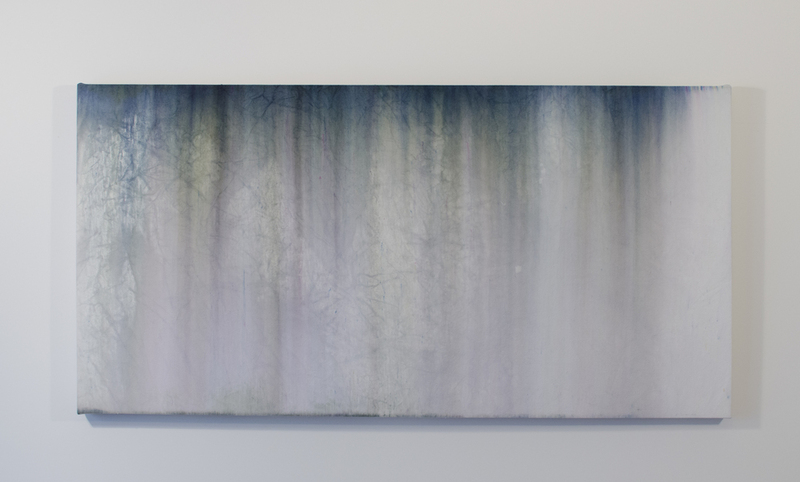 Rainfall is a series of paintings that explore the inherent beauty and complexity of rain events. Each painting is a collaboration with nature. I build the stretcher and stretch the canvas. I place the canvas and prepare the pallet. I relinquish control when I allow the storm to create the imagery. Each impacting drop activates the pigment and carries it through the canvas. The flow of the water as well as the force of the wind push and pull the color across the surface as well as through the fibers, creating different saturations, textures, and patterns. As the water wicks through the canvas, the qualities of the canvas are also revealed, the weave, the wrinkles and the pills enable or inhibit the flow of water, showing other systems. The marks vary widely depending on the amount of rain, as well as the duration and intensity. A drizzle may leave evidence of each individual drop, while a down pour will leave behind more of a striated color wash, each particle of pigment leaving a mark like a comet with a soft tapered coma. A long, hard rain may wash away a majority of the color, leaving the surface with only a subtle variation of color and texture. Each painting is unique because each was placed in a unique circumstance; no two rain storms are the same, and no two locations within each storm are the same. The aesthetic is determined not by a consciousness or even an unconsciousness, but a non consciousness. Each mark is determined by the forces acting around it, regardless of judgement or interpretation. The rain is blind and unaware of the process. Video runs at 10x speed.